Skype has confirmed it has developed 3D video calls. The news was revealed by a senior executive in an exclusive interview with the BBC to mark Skype's 10th anniversary. There had been speculation about the possibility after the firm posted an advert in April saying it wanted to find a way to create "body-doubles" for workers unable to travel to meetings. However, the executive warned it could be many years before the tech launched. "We've done work in the labs looking at the capability of 3D-screens and 3D-capture," said Microsoft's corporate vice-president for Skype, Mark Gillett. "We've seen a lot of progress in screens and a lot of people now buy TVs and computer monitors that are capable of delivering a 3D image. "But the capture devices are not yet there. As we work with that kind of technology you have to add multiple cameras to your computer, precisely calibrate them and point them at the right angle. "We have it in the lab, we know how to make it work and we're looking at the ecosystem of devices and their capability to support it in order to make a decision when we might think about bringing something like that to market." A decision by Skype to support 3D could provide a boost to device-makers at a time the format has shown signs of flagging. Disney's ESPN division recently announced it was dropping a 3D channel and the BBC has said it would end a two-year experiment with the extra dimension after the broadcast of the Doctor Who 50th anniversary episode in November. In addition, retailer John Lewis has said it has seen dwindling consumer interest in the technology, despite the fact that 3D had become a standard feature on many higher-end displays. However, there are those who champion the standard. They include James Cameron - the movie director behind Avatar - who recently told the BBC it was "inevitable" that all entertainment content would eventually be made in 3D once special glasses had stopped being needed "because that's how we see the world". Mr Gillett said he agreed with Mr Cameron's claim, but warned 3D video chats would take longer to catch on than other uses. "I can imagine a day when you have a 3D-cellphone screen that doesn't need 3D-glasses to use it," he said. "It's less clear to me that we're close to having 3D cameras on cellphones. "We're in the first year of your TV at home potentially having a camera attached to it, but we're several years away from the cameras capturing 3D in that context. "You'll see much more penetration of 3D on TVs, on computers and ultimately in smartphones, probably, ahead of seeing it for sending a video call." In the meantime Mr Gillett said Skype was exploring how to offer 1080p "super-high definition" video call resolution to other devices apart from the forthcoming Xbox One video games console. Since the standard would require extra processing power, he added that tablets and laptops were set to gain the facility ahead of smartphones. And he would not rule out the software coming to Sony's PlayStation 4 which will compete with Microsoft's machine. "We've worked with Sony for a long time," he said. 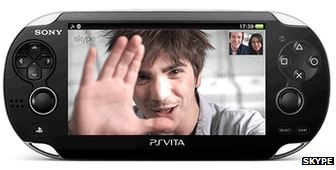 "Skype ships today on the PlayStation Portable amongst other cross-platform devices that we deliver to, and for the last few years we've also been shipping versions of Skype that run on Sony TVs. "We're obviously not party to their pre-release [PlayStation] hardware road map [but] we're committed to cross-platform." Mr Gillett would not comment on leaked documents suggesting the US National Security Agency had been able to spy on Skype video calls since July 2012. The Guardian quoted one memo as saying: "The audio portions of these sessions have been processed correctly all along, but without the accompanying video. Now, analysts will have the complete 'picture'." Microsoft previously declared that any changes it has made to Skype's systems since acquiring the business in 2011 "were not made to facilitate greater government access". Mr Gillett did say that the takeover had resulted in several advances including the integration of Skype into Microsoft's Outlook email service and its forthcoming Windows 8.1 operating system. However, Taavet Hinrikus, Skype's first employee and its former marketing director, told the BBC he was not convinced. "It's unfortunate, but the company has lost focus on product and delighting its users and instead has been busy with corporate restructuring and being bought and sold," he said. "Skype should refocus itself on providing the best communication tools and fight hard for mobile. "Today companies like Whatsapp, Viber and others are leaders in the mobile communication space - that's something that Skype has to fight hard to get back." By By Leo Kelion. We found it on BBC.